Healthcare marketing – are you feeling trapped? The weight of our stories can keep us trapped and held hostage in our proverbial box. But if you’re in healthcare marketing, now’s the time when you need a story that acts as a great emancipator. One that makes people care, believe and act – and carries them, your healthcare brand and business to a new destination. Today, every brand is only as strong as the stories people tell about it. Because “we”, the people, are the media. And we’ll only spread stories that are worth talking about – either the really bad stuff that upsets us, or the good stuff that brightens our day. In the current healthcare marketing environment, the need to tell (and deliver upon) better stories is crucial to survival. Traditional health system and hospital competitors are consolidating, and pockets are deeper. New retail and technology competitors (some with already strong customer followings) are disrupting. The playing field is forever changed. And it’s possible that your old story has outgrown its utility and relevance. You need a new one that cuts across old boundaries, limits and categories. We know that our healthcare marketing actually can benefit humanity. So how could people not pay attention? How could they not care, believe in and act on your story. How could they not get that mammogram? Take that prostate exam? Get that elective surgery at your facility? Because better healthcare branding begets better healthcare marketing. Which begins with a better story. One that goes beyond the basics and generalities of what every hospital offers and the awards we tend to too often celebrate. It’s important to remind ourselves that people don’t really buy a service. Instead, they buy the story that’s attached to it. The old rules of the healthcare game are obsolete. To win, you need to navigate outside the boundaries of the traditional playbook. This climate requires new thinking, new tools, and new approaches. Importantly, it also requires as a starting point, a new story. Because you can’t realize new possibilities with the same language. 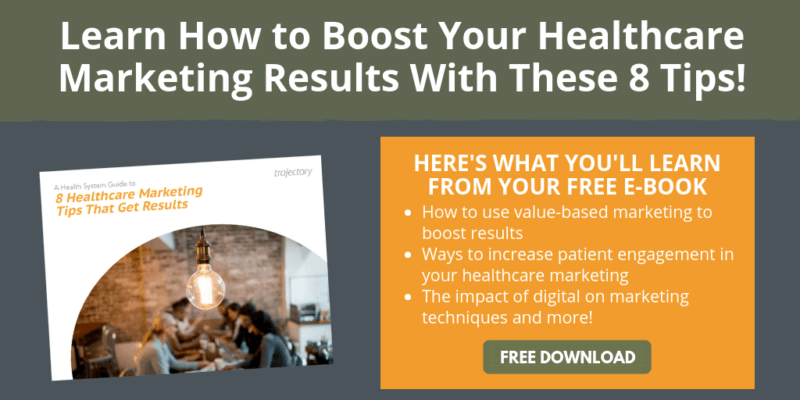 If you’re a healthcare marketer, it’s likely time to move beyond your current story’s constraints and find a more effective means of large-scale change. If you’re not sure if your current healthcare story measures up, and where you might find places you can strengthen your story’s engagement factor, reach out. Since 1999, Trajectory has worked across the health + wellness continuum, helping clients use every moment as an opportunity to move customers, brands and businesses upward to a new destination.